A Really Unexpected RevelationHannah Arendt, most famous for her contention concerning the banality of evil in her writing about the trial of Adolf Eichmann in Jerusalem, died in 1975. Remarkably, however, she provides an explanation in her Life of the Mind for the social as well as political situation in which we find ourselves in 2018. Like many I am bewildered how a man like Trump - mendacious, corrupt, vulgar, misogynistic, and incompetent - can insinuate himself into a political system, like that in the United States, which is explicitly designed to avoid such an outcome. Arendt supplies some answers I find compelling; and in a strange way, comforting because they suggest that while the world is very strange indeed, it is not entirely without order.Arendt’s fundamental distinction is that between truth and meaning. “Reason,” She says, contradicting an unstated axiom of both liberalism and science, “is not inspired by the quest for truth but by the quest for meaning. And truth and meaning are not the same thing.” The tendency of liberal thought is to “interpret meaning on the model of truth.” And then to evaluate the world, especially other people, in terms of their expression of truth. This she says is a fallacy, and I see her point.Arendt takes Immanuel Kant seriously when she says, “No eliminating of errors or dispelling of illusions can arrive at a region beyond appearance.” At best, as the Pragmatist philosophers have demonstrated, we are engaged in an endless search for the truth about the world. What we have in the bag as it were is appearances. We are effectively stuck with things are they want to be seen. “The expressiveness of appearances expresses nothing but itself,” she says rather elliptically. Appearance is the surface that we skate on in daily life. “Error is the price we pay for truth; and semblance is the price we pay for the wonders of appearance.” And most of us deal with the problem of semblance in a very routine way that doesn’t seem to attract the degree of interest that error does by social scientists or political commentators. “The reality of what we perceive,” Arendt says, quite accurately as well as succinctly, “is guaranteed by its worldly context, including others who perceive as I do.” Thomas Aquinas called this in the 13th century the sensus communis, the feeling of a group, and used it as the ultimate mark of correct religious doctrine. So the idea has a long philosophical pedigree. In fact the biblical concept of the Logos, the Word, as it is used particularly in the Gospel of John and in prior Jewish philosophy, is one of coherent speech. It refers not to truth or falsehood but to meaning, the import of truth and falsehood. The real political phenomenon of significance is not Trump but the self-discovery, with the help of modern technology, of a group within which there is such shared meaning.Meaning occurs not in the details but in an apprehension of a whole, a coherence which often can’t be arrived at through rational much less scientific methods. Once arrived at, meaning can be impervious to the truth or falsity of the elements through which it had been achieved. Such resistance to factual argument may appear as obdurate stupidity, emotional awkwardness, or lack of serious engagement. But it probably isn’t any of these things. Trump has provided meaning for millions of Americans, many of who claim they do not care about the truth of his character or abilities. Such an attitude is incomprehensible to the liberal mind. But this is because we go on ad nauseam about the costs of error in trusting and electing a man like Trump. What we should be discussing is not the error of Trump but the semblance of Trump, what meaning he provides (not necessarily the meaning he wants to supply). This meaning is likely to be peripheral to the political issues of immigration, elitism, race and religion. None of these individual issues really seem to matter that much to his supporters once he entered office. They know something that those who think about liberal truth don’t know; perhaps even something larger that the focus on error misses. The decision about what is worthwhile knowing is not one that liberal thought has paid much attention to. Perhaps it is this that is the core of the current ‘interruption’ in the American political system: making decisions about what’s really important is more important than being right about how the world works.Appendix: The Aesthetic of the Idiot SavantSince I posted the review above, I have received several messages saying essentially: OK so what is the aesthetic of Trump? These provoke me to, like Steve Brody, take a chance. I emphasize that the Trumpian aesthetic is not what he sells but the semblance that his supporters buy. My assessment of what they’re buying is in no way analytical since I don’t know many of them. But from the ones I see and hear on the news and tv commentaries I can make at least a guess.I will use the phrase Idiot Savant to characterize the general Trump aesthetic. Both words can be interpreted negatively or positively depending on one’s political proclivities. ‘Idiot’ for example refers in the original Greek to a political loner, and since the 19th century to mental defectives. Savant, similarly, can denote both a learned person as well as an autistically challenged individual. I hope therefore that I have avoided bias in either direction.The components of the Idiot Savant aesthetic are probably as numerous as Trump’s individual supporters. But I think there are some generally important memes that provide a common meaning. Here are some of the most striking:- Intelligence is not a pre-requisite for success.- We are all flawed; the only essential virtue is self-confidence.- Celebrity is the real mark of integrity.- Religion consists of conditional fealty to one’s tribe.- The condition of fealty is that the tribe maintains its faithfulness through mutual encouragement and control among themselves. - Disfavour shown towards individual members of the tribe is a sign of corrective regard and does not imply permanent exclusion.- The only real evil in the world exists outside the tribe.- Politics is a business that is inherently corrupt and diminishes the value of life the more it is engaged in.Obviously there are any number of other elements that are consistent with these but I think they capture the totality of the Idiot Savant. The ‘precepts’ are both materialistic and spiritual. They evoke historical references to the astronaut, the cowboy, the Washingtonian revolutionary, even back to Paul of Tarsus and his single-minded, single-handed creation of a new religion. The allusions to the Old Testament divinity are not incidental.Naturally the Idiot Savant has a target enemy aesthetic. For many the simple rejection of this target provides all the meaning necessary for the adoption of the Idiot Savant. I will characterize this enemy aesthetic as that of Liberal Meritocracy, which rejects semblance itself as an acceptable category. Liberal Meritocracy holds that there are valid socially derived standards of behaviour and advancement which are the same for everyone. The adherents of Liberal Meritocracy are professionals of most kinds, city-dwellers, and successful members of minority groups. These happen incidentally to include large numbers of Jews, Blacks, Mexicans, and immigrants, many of whom are Muslim.I welcome all correction or extension of the aesthetic. A very interesting account of what do we do when we think. Where are we when we think? Why do we think at all? At times a complicated text, full of erudite references to Aristotle, Socrates, Plato, Nietzsche and other philosophers, but never boring. Arendt recognizes 3 basic mental activities – thinking, willing and judging. The first section, Thinking, is the best and the most stimulating read. It is a pity Arendt didn't have time to finish this work, she died, left it unfinished, and it was edited by her friend Mary McCarthy.For those interested in thinking, its origins and explanations, I highly recommend it. Quotes: "For thinking, withdrawal from the world of appearances is the only necessary precondition. In order to think about somebody, he has to be removed from our presence. Thinking always implies remembrance, every thought is strictly speaking an after-thought..." "Thinking is a natural need of human life, not a prerogative of the few but an ever-present faculty in everybody; by the same token, inability to think is not a failing of the many who lack brain power but an ever-present possibility for everybody – scientists, scholars and other specialists are not excluded … A life without thinking is quite possible … But then life is not fully alive – unthinking men are like sleepwalkers." One of the most impressive philosophy books. She takes simple observations about thinking and the thought process from everyday life(some might call it phenomenology) and draws radical conclusions as well as reaffirming the importance of a philosophic approach to the everyday. I like to reread it once every few years. "Everything that can see wants to be seen, everything that can hear cries out to be heard, everything that can touch presents itself to be touched. "-from book one, "Thinking"
Oh, with or without Hannah I'm never going to graduate. Fascinating. But so difficult to read at times that I had to read it aloud to myself to keep from getting confused. I am not proud of that. In a discussion of Duns Scotus, the esteemed 'subtle doctor' of medieval theology, Arendt here at some point quotes Pico della Mirandola, who was reputed to have remarked of himself: "Pledged to the doctrine of no man, I have ranged through all the masters of philosophy, investigated all the books, and come to know all the schools". Although cited in reference to Scotus, there is perhaps none better to whom the epithet applies than Arendt herself, who has, it's pretty clear, ranged, investigated and studied the Western canon to a depth of almost unbelievable proportion. But more than just erudition, it's her ease of expression which sets her apart, with her discussions of classical philosophy coming off as a conversation among friends, as though for all their distance in time, neither Kant nor Merleau-Ponty, Augustine nor Heidegger (among others), could be ignored except at the price of giving up on living thought itself.And it's thus to this 'life', this vitality of Mind whose currents remain active today, that Arendt attends to, infusing it with a contemporary significance that goes far beyond any standard historical retelling. After all, as she writes in the introduction, it was her encounter with the thoughtlessness of Adolf Eichmann (who, to recall, was the logistics point-man for the Holocaust, and whose trial in Jerusalem Arendt famously reported on), that spawned these investigations: in the face of such 'thoughtlessness', do we not owe ourselves the necessity of properly grasping thought all the better? Such, at any rate, are the stakes involved in The Life of the Mind. As for its execution, well... I couldn’t be more torn. Almost precisely in two, in fact, given that of the two printed volumes here (the third, on 'judgement', was never written), the first, on 'thinking' is magnificent, while the second, on 'willing' is... not so much.I say this though, with all due prejudice. Which is to say that it's not really Arendt's fault that the very idea of willing simply doesn't hold a candle to the force and the interest of thinking, even on Arendt's own terms. Around 'thinking', for instance, Arendt will construct (or rather 'extend', from her earlier writings) an entire phenomenology of 'appearance', of the way in which appearance is never just 'mere appearance', but is the very manner in which humans engage with the world around them; so too will she elaborate a theory of metaphor and the body, along with a brilliant and engaging philosophy of both truth and meaning (here crucially distinguished), all the while remaining attentive to the rich conceptual histories surrounding these various ideas (if you like your reading peppered with choice passages of Latin and Greek, Arendt's your lady).As for 'willing', while Arendt does her utmost to sustain the same philosophical intensity, the constellation of ideas around it simply don't match up: while classic themes like necessity and contingency, intellect and desire, and even love all permeate the discussions of the will, when placed side by side, the entire second volume feels like a massive drag on the momentum of the first. On a purely personal note, it doesn't help too that Arendt's The Human Condition, which is perhaps one of my favorite books of all time (and to which this also constitutes a kind of sequel), is simply so much more interesting than The Life of the Mind as a whole. And it's by that contrast too that I really can't give this book the glowing praise that it might get - with all due legitimacy - from another reader. In any case there's lots here to learn from, which, in its own way, is the highest praise one can give (3.5 stars if I could). Twenty-four years after I purchased it, I finally read the Life of the Mind, having gone on something of an Arendt binge this past year. As with all of Arendt’s works, The Life of the Mind is steeped in western Philosophy. The book, originally planned in three parts, consists of an historical interpretation of thinking and willing. Judging, the third part, was never started due to Arendt’s untimely death in 1974. Thinking, for Arendt, always leads to a kind of twoness, a bifurcation between what appears to be as opposed to what is. Twoness takes places as an inner dialogue between the self and an other in the activity of thinking, but always comes back to the gap opened up between what was and what will be, as the mind attempts to secure what is in an eternal present.Willing, on the other hand, takes up the question of whether the will exists at all, and if it does what does it mean for the concept of human freedom. Arendt runs through medieval and modern philosophers (Augustine, Duns Scotus, Nietzsche and Heidegger) before coming to terms with the assertion that because philosophers are uncomfortable with contingency, they are uncomfortable with the will. Scotus, she argues, is the only philosopher among these whose commitment to freedom leaves him open to the contingent and the new. In many ways, the section on willing is worth reading, simply for her treatment of Duns Scotus. The book ends with an analysis of political freedom and action as an opportunity to ask the question of willing differently. Here she takes up the Roman and the Hebrew notions of founding political societies. 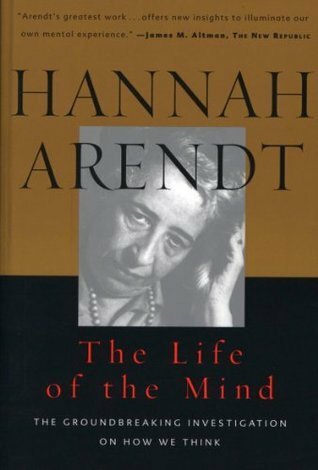 In each, she finds similar problems exposed that she finds in the treatment of free will for philosophers: the tension between a new community and the old, the place of the new in time, and the effect of history on the present.The Life of the Mind, like all of Arendt’s works, is fascinating and worth reading closely. Arendt’s command of philosophy and the western tradition lead to revelations of thought and freedom that few twentieth century philosophers can match. This is Arnedt at her most lucid, eloquent, thought-provoking, and interestingly, most erudite state of mind. It took a long time for me to get through the first section (Thinking), but once I did, the following two sections on Willing and Judging seemed ten times easier; partly because you get used to her prose, her jargons, her way of thinking, analyzing and approaching things, and partly because the content of these two sections are not as dense, and unfortunately, due to her untimely death that left the book unfinished, are not as comprehensive. Most of the material discussed in the last section was put together based on Arnedt's notes and lectures here and there on the topic, and as such, this last section is the least cohesive and convincing, to me at least. But all in all, this is definitely a unique book with the capacity to challenge some of your most-dearly-held ideas on how the mind works which you'd thought you knew so well after reading Heidegger and Nietzsche. Definitely worth however amount of time you spend reading it as you'll come out of the other side a little bit more humble, a tiny bit wiser, and a whole lot more self-conscious and self-aware about the way you think. A unique read. Well written and thought out. There is a moment in The Life of the Mind in which Arendt mentions if she does not acknowledge a certain philosophical theory, she would face death. This hyberbolic statement has some feeling of truth to it for anyone who has been (or has tried to be) an academic. Alan Watts once remarked that you can always throw someone off balance simply by asking them what they forgot. This is not something one would not do in real life; but which one would absolutely do in academia (I remember being in love with an academic, attending her thesis defense, and seeing the vigor in one of her adviser's statements that she should have read a particular book and used it; I had read the book he was referring to and realized then his game, to throw her off balance).Academic writing, then, necessarily has some built in constructs and requirements; even a book like The life of the mind, meant more for a general reading public, has its author going to great lengths to keep academic structure and thoroughness. Many of us read texts that are academic in college and grad school, and then quickly abandon the practice in our post-graduate life; the only thing we stop doing with even more exuberance is the writing of academic papers, unless our careers depend on it. This end to reading texts that look academic may scare someone away from reading this book, which clock in at around 600 pages. However, to run away from this book just from this impression may be a mistake. Yes, it goes to great lengths to make the moves of an academic work, but underlying all the citations and writing structure is nothing less than a celebration of philosophical thought, and a warning against what our society would be if we became unthoughtful. The argument made throughout the book, that a thinking society is the essential thing to keep authoritarianism at bay, and a non-thinking society is the essential thing that leads to it, seems particularly relevant today, as it did at the time of her writing. Arendt, in trying to understand Nazi Germany, makes the startling conclusion that not thinking leads to uncritical thinking in the face of any tyrant or despot who wants to take over: the tyrant need only to tell a story that appeals to emotion, by some reinvention of the past or redefinition of what a future should be. It's not hard, then, to draw connections (Make America Great Again, for one, starts to seem brilliant given the right context). I will go for my own hyperbole, and conclude that reading this book is a revelation. You can't read this without feeling a sense both of your own individual importance and your own individual insignificance; how important it is to understand that before you were born there was no you, and after you die there is likewise no you, and this space where this you matters a great deal. In one passage Arendt remarks that, at least philosophically, we could see our lives as entirely a dream of our own making, only waking as our life ends. If this is true (and if we believed it why would it not be? ), we are foolish not to make this dream beautiful.I've long suspected that, given the state of affairs in the U.S. currently, there is no royal road to a new understanding. The comedy, the social media responses, it all seems to be free will, but how much of it can be predicted before it's even said? And how stupid it sometimes seems, when at the same time we seem to value the very things we say we detest (celebrity without accomplishment; wealth above morals or doing what is right). I don't like it much either, but it seems the true cultural change comes from reading authors like Arendt, and spreading the ideas around. I could be wrong, but its worth a shot; lord knows Twitter does us no good. As David Byrne once famously sang, "baby what did you expect staring at the TV set, fighting fire with fire". This book is very important and worth careful study. Arendt takes up where Kant's Critique of Pure Reason stops, showing how "reason" goes beyond conceptual knowledge. Knowing that Arendt was one of Heidegger's most important students, you can see places where she is pointing toward Heidegger's non-representational 'thought' as the path beyond knowledge and into the unknowable metaphysical realities. She is at her best in the first section of this two volume work, where she deals with thinking per se, although I found her analysis of judgment quite interesting as well. In any event for those who wish to see through the veil to the other side, this last work of Arendt's is a valuable piece of the puzzle. She claims less than she accomplishes to the perceptive reader. Most philosophers accept that Kant has limited knowledge and that the rest, the questions of metaphysics, cannot be known as scientific knowledge. But really Kant's delimitation of scientific knowledge frees our search to go beyond representational thought to a higher mind. Arendt doesn't always know this, but we can use her to reveal what she couldn't yet see in her time and world.She lays out what she is doing pretty well in her Introduction, but rarely ties it all together again. Great book about thinking as viewed by philosphers over the ages. Somewhat difficult to grasp the phrases in Latin and German that occur often. I especially like her statement that The present is slippery, the now changes to then, the past, and ahead is the future approaching but not yet there. We live in between the past and the future. The present is a life-long fight against the dead weight of the past while hope drives one forward. Yet fear drives man backward toward the quiet of the past and memory of the reality one can be sure of. Another favorite of mine is the staement by Epictetus that philosophy teaches us the art of living. aslında thinking, willing ve judging olarak üç cilt halinde planlanmış fakat willing'i bitirdikten bir hafta sonra vefat etmiş. heidegger'in, her ne kadar otuzların sonunda bu planı terk etmiş olsa da, -kısmen editörünün erken baskıdaki ısrarı yüzünden- yazmadığı üçüncü bölümünün metafiziğin yerle bir edilmesine ayrılmış olması manidar. arendt de willing'i heidegger'in planını terk edişi üzerinden ele alarak bitiriyor. onun hükmü ne olacaktı acaba? ismet özel'in kendine yakıştırdığı gibi, muamma olarak gelmiş bilmece olarak gitmiş bu dünyadan. Easy to read? Not so much, but if you enjoy summaries of major philosophies you may find it fulfilling. I wish Arendt had contributed more of her personal thoughts on the matter instead of just giving a history of philosophy. Begriff- Reason. The German thought-experiments, fearsome in their density. The Raskol- sovereign trickster, white shaman, standing outside the community, representing it in the animal and planetary consuls, delivering their edicts. This book will change the way you think. Arendt focuses on the space of being, the appearance of self that others see. Its a lengthy book, but you'll want to take a while to read it so you can digest what the author is saying. An excellent survey of the history of Western thought as told from one of the most brilliant minds of the 20th century. Just brilliant, and superbly edited by Mary McCarthy after the author's death. what makes us think ? i found this text very useful in helping to understand some of arendt's other texts (eg. eichmann in jerusalem + origins of totalitarianism). easier to read and helps explain a lot of the background thinking behind the concepts she describes in her other books. Interesting read. Good to see a distinction between 'truth' and 'meaning'. Essentially an argument as to why Science needs Philosophy. Trust yourself, G. You know this. A modern day guide to ethics, morality and critical analysis. Hannah Arendt Mary McCarthy - Hannah Arendt (1906–1975) was one of the most influential political philosophers of the twentieth century. Born into a German-Jewish family, she was forced to leave Germany in 1933 and lived in Paris for the next eight years, working for a number of Jewish refugee organisations. In 1941 she immigrated to the United States and soon became part of a lively intellectual circle in New York. She held a number of academic positions at various American universities until her death in 1975. She is best known for two works that had a major impact both within and outside the academic community. The first, The Origins of Totalitarianism, published in 1951, was a study of the Nazi and Stalinist regimes that generated a wide-ranging debate on the nature and historical antecedents of the totalitarian phenomenon. The second, The Human Condition, published in 1958, was an original philosophical study that investigated the fundamental categories of the vita activa (labor, work, action). In addition to these two important works, Arendt published a number of influential essays on topics such as the nature of revolution, freedom, authority, tradition and the modern age. At the time of her death in 1975, she had completed the first two volumes of her last major philosophical work, The Life of the Mind, which examined the three fundamental faculties of the vita contemplativa (thinking, willing, judging). Free eBooks Jaspergerard.co.uk Library is in no way intended to support illegal activity. We uses Search API to find the overview of books over the internet, but we don't host any files. All document files are the property of their respective owners, please respect the publisher and the author for their copyrighted creations. If you find documents that should not be here please report them. Read our DMCA Policies and Disclaimer for more details. Copyright ©2019 Free eBooks Jaspergerard.co.uk Library - All rights reserved.